The hot action took place around the 3.7 GHz band, where the relatively small amount of spectrum on offer – 200 MHz – and the presence of a new fourth player – Iliad – ensured supply outstripped demand. When we last checked in the bidding had already become frenzied, but they still managed to keep it up for another nine days. 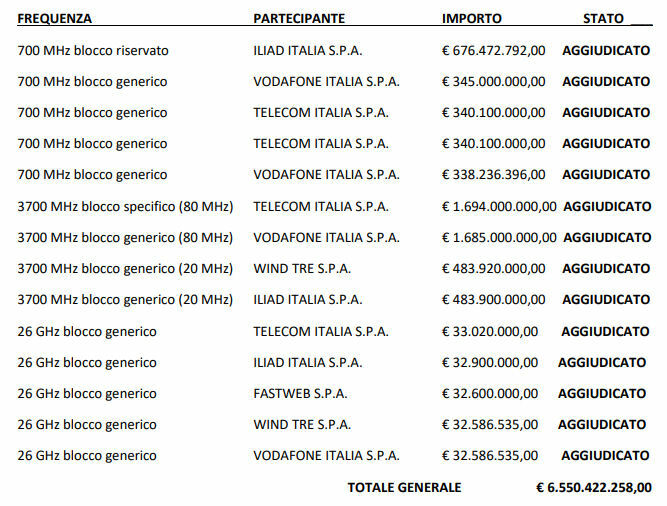 As you can see from the final table published by Italy’s Ministry of Economic Development below, the final amount of cash trousered by the Italian government was €6.5 billion, around three times more than was expected at the start of the process. In hindsight that seems pretty naïve, especially when it came to demand for 3.7 GHz spectrum, but then again Italian operators have paid way more than any other European country for this decidedly limited spectrum. We could go through all the European 5G auctions ourselves in order to calculate the average price per MHz paid for mid frequency spectrum, but why bother when Iain Morris from Light Reading has already done so and we can just rip off his work? In Finland’s recent auction 390 MHz of mid frequency spectrum was offered up to three operators. At least in part due to there being so much more spectrum on offer the Finnish operators only shelled out the equivalent of four cents per MHz, according to Morris. The traditionally exuberant UK operators dropped 15 cents per MHz in their equivalent auction but the Italians dwarfed that in dropping 42 cents per MHz. Telecom Italia seemed happy with the outcome in a press release. “By securing all three band frequencies put on auction, TIM strengthens its network leadership in Italy,” said CEO Amos Genish. “The new frequencies acquired represent a core asset for the Group’s future development and, at the same time, for the ongoing digitization of Italy.” The release also said the 26 GHz block was 200 MHz wide, which was presumably the case for everyone.